What did Napoleon look like? A silly question, you might think. Napoleon is one of the most painted and sculpted persons in history. When Matt Dawson was designing the cover for Napoleon in America, we agreed he didn’t have to show Napoleon’s face – the hat and coat would be enough. But remove those props and are you sure you’d recognize Napoleon if you met him on the street? 1. The artists didn’t have Napoleon as a model. 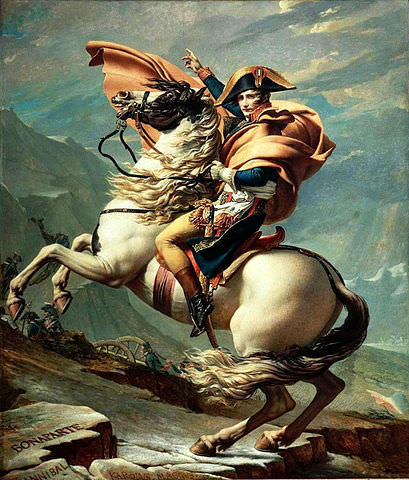 Napoleon rose to prominence when he began winning battles as commander of France’s Army of Italy in 1796. Artists who were eager to meet the demand for images of the conquering general didn’t necessarily know what he looked like. Their paintings and drawings were based on second-hand descriptions, or on pure imagination. For example, we can be pretty sure Napoleon didn’t look like this. 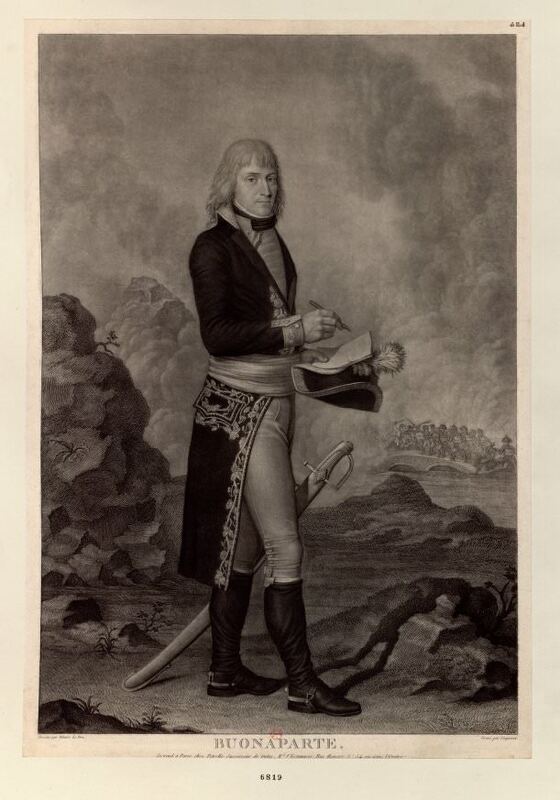 Buonaparte generalissimo de la Republiqua di Franci in Italia, September 1, 1796, by I. Marcelli (engraver S. Grobileti). Bibliothèque nationale de France. This is perhaps slightly closer. Buonaparte, ca. 1796, by Hilaire Le Dru (engraver Pierre Charles Coqueret). Bibliothèque nationale de France. David later realized that he had got Napoleon’s eyes and mouth wrong, which he corrected in a subsequent version of the painting (he produced five different versions). 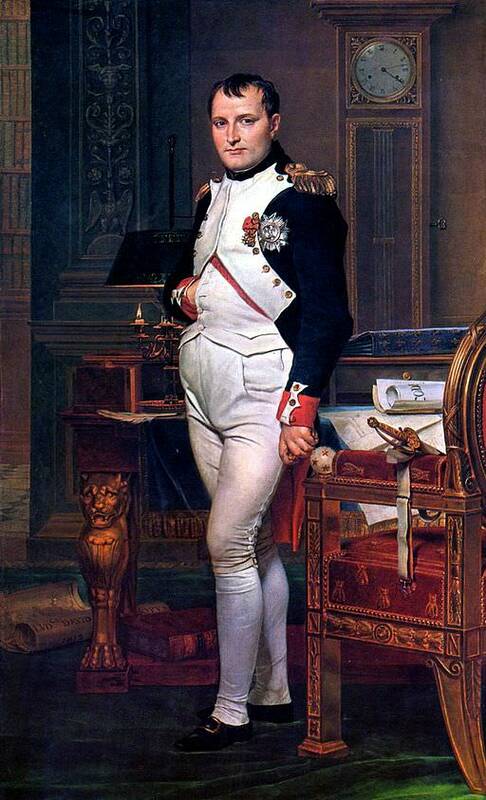 A lot of paintings of Napoleon were done after his death. Those artists obviously didn’t use him as a model. 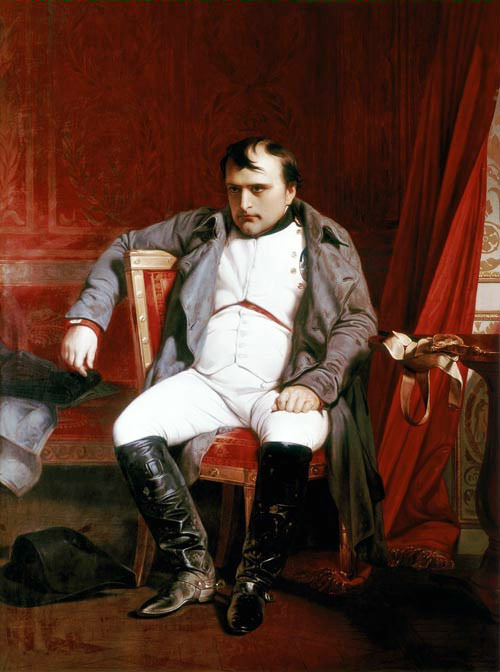 This includes Delaroche’s well-known painting of Napoleon after his 1814 abdication, which was actually painted in 1845. It also includes most paintings of Napoleon’s exile on St. Helena, such as the painting in the background of my website banner – St. Helena 1816, Napoleon dictating to Count Las Cases the Account of his Campaigns, by Sir William Quiller Orchardson. 2. Napoleon fashioned his image. Napoleon was a master propagandist. Even when artists had Napoleon as a model, the final results were not necessarily an accurate reflection of the man they were looking at. When Antoine-Jean Gros painted Napoleon at Milan in 1796, he couldn’t get Napoleon to sit still. Josephine finally had to take Napoleon on her knees and hold him there for several minutes. (2) This did not give Gros sufficient time with his model, though Count Lavallette said the resultant painting was a good likeness. The painting represents Napoleon at the bridge at Arcole (Arcola). Though Napoleon was not the first to raise the French flag on the bridge (he copied General Pierre-François Augereau), did not actually cross the bridge, and failed to rally his men to him (Napoleon got pushed into a water-filled ditch as his troops rushed to retreat) – one would never guess this from the painting. 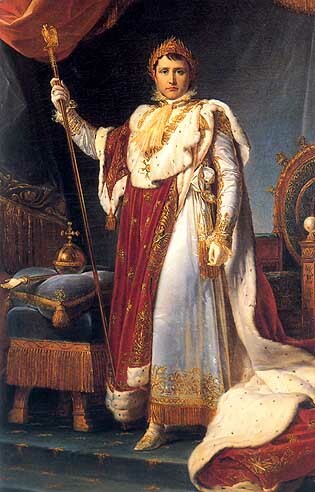 Napoleon in his imperial robes, by François Gérard, 1805. Like most paintings of Napoleon, this is an exercise in iconography rather than realism. 3. People who knew Napoleon well said his portraits didn’t fully capture him. What is the best likeness of Napoleon? So what did Napoleon look like? The bust by Antoine-Denis Chaudet referred to by Marchand portrays Napoleon along the lines of an ancient Roman emperor. It became the official sculpted likeness of Napoleon. Twelve hundred marble versions were produced in Italy, for distribution throughout the Empire. These models were prodigiously copied, not always faithfully. Though Chaudet’s bust may bear a closer resemblance to Napoleon than David’s painting (which Napoleon quite liked), one suspects there was some image-doctoring involved. For what Napoleon really looked like, perhaps we should listen to the member of his family who knew him best. 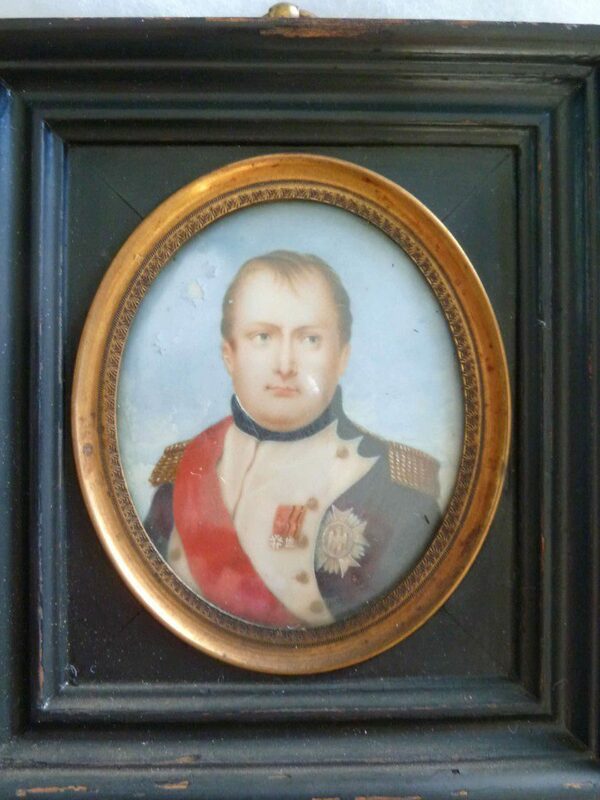 According to Joseph Bonaparte’s friend Nicholas Biddle, Joseph said “the best likeness” of Napoleon was a miniature portrait that he had in his possession in the United States. (7) The artist George Catlin made a copy of this portrait for Biddle. The copy now belongs to The Andalusia Foundation (object #2006.01.05). 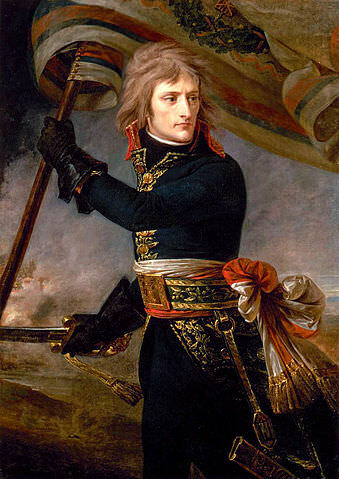 Personally I think Napoleon looks a bit like Jeff Daniels in it. Copy by George Catlin of the miniature portrait that Joseph Bonaparte said was “the best likeness” of Napoleon. Photo courtesy of The Andalusia Foundation. Used with permission. For more about what Napoleon looked like, there are a huge number of written descriptions by people who saw him first-hand. Tom Holmberg has collected some of these on the Napoleon Series website. For an intriguing argument that many of the artists who painted Napoleon fused their own features with his, see this article by Simon Abrahams. With thanks to Usman Sheikh, whose question in the Napoleonic Historical Society Facebook group got me thinking about this topic, and to Connie Houchins, Executive Director of The Andalusia Foundation, for advising me of the location of the Catlin miniature and giving me permission to use the image. 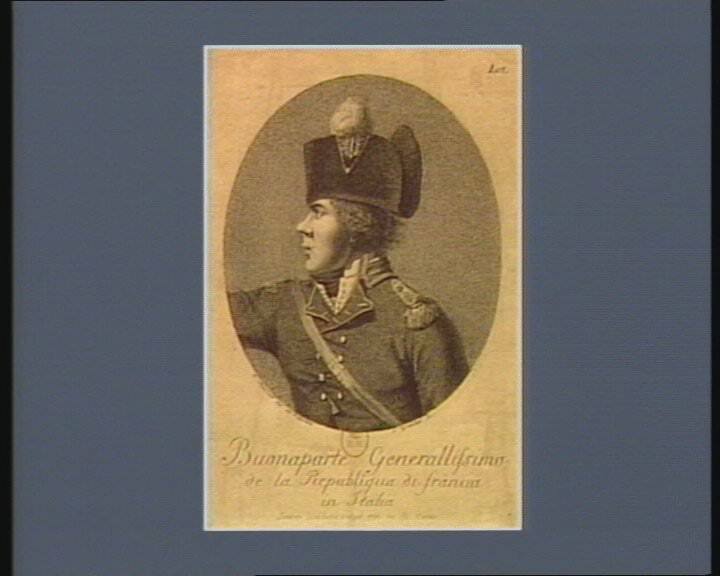 Antoine-Claire Thibaudeau, Histoire Générale de Napoléon Bonaparte, Vol. 6 (Paris, 1828), p. 330. Antoine Marie Chamant, Mémoires et souvenirs du comte Lavallette, Vol. 1 (Paris, 1831), p. 193. Philip Dwyer, Citizen Emperor: Napoleon in Power (New Haven & London, 2013), p. 38. Lucia Elizabeth Balcombe Abell, Recollections of the Emperor Napoleon, during the First Three Years of His Captivity on the Island of St. Helena (London, 1844), p. 21. Louis-Joseph Marchand, In Napoleon’s Shadow (San Francisco, 1998), pp. 90-91. Charles J. Ingersoll, History of the Second War between the United States of America and Great Britain, Second Series, Vol. 1 (Philadelphia, 1853), p. 148. Nicholas and Edward Biddle, “Joseph Bonaparte as Recorded in the Private Journal of Nicholas Biddle,” The Pennsylvania Magazine of History and Biography, Vol. 55, No. 3 (1931), p. 216. The death mask of Napoleon is, of course, the absolute truth of what he looked like (at least at the time of his death). Indeed! 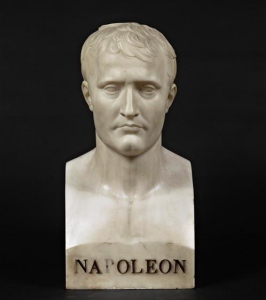 Though there is controversy over which death mask – there’s a good article about that on Napoleon.org: http://www.napoleon.org/en/reading_room/articles/files/484809.asp. There’s a gentleman who first introduced Arnold Schwarzenegger into books & muscle magazines who was the big history fan of Napoleon. I met him once and he lives in Montreal Canada. That would have been Ben Weider, Timothy. He founded the International Napoleonic Society. He died several years ago – must have been interesting to meet him. The death mask controversy is interesting. The one in the services museum bears a striking resemblance to Jerome Bonaparte and feature wise close to the hundreds of paintings of him. Also worth studying are the photos of count Walewska who was his illegitimate son, again the mouth is more like the lesser known death mask. Personally I’m inclined to believe the well known mask is that of Cipriani, again that’s just my personal opinion. Ben Weider was a great guy, I once attended a seminar on his discovery of the emperors poisoning, murdering Napoleon would have been to tempting a deed for the british, cui bono. Thanks Nick and Lally. Very interesting! Based on Fanny’s account, then (and she should know), even the original death mask is not a good guide to what Napoleon looked like alive. Incidentally, the lovely Ben Weider read my manuscript before he died and sent me an email saying “I congratulate you on your research efforts and dedicated work!” He is much missed by some of us. How wonderful to have that note from Mr. Weider, Lally. Sounds like he recognized quality when he saw it! I had always assumed that he had just “plumped up” as he got older – hence the appearance change from early to late representations. One may assume that David would have done a good job of portraiture, without too much flattery, but yet still depicting him in a noble and neo-classical manner that suited him and the fashion of the times pretty well. They do look similar, and Marchand’s and Joseph’s comments provide reassurance that they are fairly accurate representations of Napoleon. I’d like to know who painted the original miniature (on which Catlin based his copy), and where it is. I took the opportunity of studying the Dr Arnott wax caste of Napoleon this year, taken on the night of 6th May 1821 (it is signed and dated on the back). This is the ‘first edition’ death mask and is not dissimilar to the portrait by David or the bust of Chaudet. The fact that it was later owned by Jerome Napoleon and Napoleon 111 also suggests that this was the closest likeness to the Emperor. I have pictures of this momentous occasion I can send. Thanks, James. I’ll follow up directly. Succeeded in catching attention in part because of the sense that we know Napoleon especially what he looked like. An imaginary construct. I’m most interested to discover your website and the existance of your book on Napoleon in America. I have not yet had the opportunity of reading your book so am not sure of the “life” you envisage for Napoleon in America. For many years I have studied this subject and now I am retired and find the time, I’m busy since 2013 in detailed research of history of central and north America in the period 1815 to 1845 and in writing my own book on Napoleon in America. My book 1 is set in 1815 when I succeed in Napoleon evading capture and going to America with Joseph and it is practically finished. Book 1 details the post Waterloo period in France and Napoleons decisions in La Rochelle; brother Joseph’s intervention to persuade his brother to trust in escape; and with the adventure of escape and arrival in New York in 1815. I have scenarios for 3 or 4 more books covering the periods from 1816 up to 1835 when I imagine his death. Book 2 will take him up to end 1820. 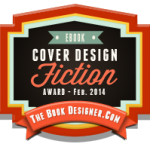 The reviews of your book seem interesting and obviously you have achieved something well written and researched. PersonallyI feel Napoleon’s physical and psychological condition had by 1821 reached such a low level that I am not sure he could have been revived by then, and I doubt even he could have supported the long sea journey from St. Helena. I hope we can correspond as obviously we shaqre a common interest and the potential opportunites Napoleon would have found once in America are so immense so consider. Thank you, Barrie. Napoleon coming to America is a fascinating “what if” and I’m glad to see you’re tackling it as well. I agree re. 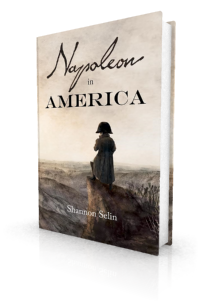 the difficulty of Napoleon surviving in 1821 – see my interview on the Little Reader Library: http://thelittlereaderlibrary.blogspot.co.uk/2014/01/napoleon-in-america-shannon-selin.html?m=0. Best of luck with your book. I look forward to reading it when it comes out. I am overjoyed to discover all of you here. Looking forward to reading all of your ideas. I am proud to be a Buonaparte! Thanks for stopping by. I hope you enjoy the posts. Thanks for this interesting article. I have been breaking my head over what Napoleon and his siblings looked like an which paintings represent them best. There is one drawing, made shortly before his death by a British inhabitant of St. Helena, that, I think, could be very close to what he looked like, but I am not sure. I usually try to look for features that recur in portraits: shape of the nose, the mouth, the eyes, etc. And anecdotes that reveal something about the appearance of the Bonapartes. Glad you enjoyed the article, Pim. John Tyrrell has posted some drawings by Englishmen of Napoleon during his final years on St. Helena: http://johntyrrell.blogspot.ca/2013/09/images-of-napoleon-on-st-helena-1818.html. He notes: “Napoleon ventured out so little in the weeks before his death that it would have been near impossible to have made an accurate sketch of him, and I would be surprised if he ever willingly posed for one of his captors.” He also wonders whether the artists were copying each other, be it consciously or unconsciously. I like coming across written descriptions of Napoleon and his family, and seeing how these compare to the portraits. This was so fascinating! I’ve never thought of it that way. It makes a lot of sense Napoleon would have David make him resemble Caesar and Alexander in his paintings (though I doubt he looked like ether of them). The bust looks suspiciously Roman. Do you have some more information on this? I’m interested in knowing more. Thanks, Elle. Napoleon used the Roman Empire as a model in many ways. For more about that, see this post on War History Online: https://www.warhistoryonline.com/ancient-history/napoleon-as-augustus.html; and this post on the University of Kent’s Lucius Romans blog: https://blogs.kent.ac.uk/lucius-romans/2017/02/13/paris-and-rome-napoleon-and-classical-antiquity/. I always enjoy reading all your posts, they are so knowledgeable and well researched. I think I am a pretty good judge of that, because Napoleon has been my favorite figure from history since the age of 10. I have a huge Napoleonic library, seen and read countless places and articles, etc. etc. Unfortunately,in the last years some of your posts have not been registered on my tablet,very annoying. Reason unknown. Do you think you could set up a list of all your posts someday, in the Internet? So the ones I missed can be picked out and copied. That would be nice. Thanks for your kind words about my posts, Irene. I’m glad you enjoy them. If you click on “Blog” on the menu at the top of any page on the website, you will find a list of all the posts, starting with the most recent one. There’s a picture and short description for each one. Here’s a direct link to the blog list: https://shannonselin.com/blog/. Hahaha “personally I think Napoleon looks a bit like Jeff Daniels in it” I looked him up and that made me laugh. Nice post – helped me a lot with my History of Art essay – Thank you!! You’re welcome, Annabel. Glad it helped! Nobody knows if the portraits of great men resemble them. It is enough that their genius lives there.